For years, thermographers have traditionally reported apparent Delta T measurements when documenting their findings. Using a default emittance value between .8 and 1.0, apparent temperature measurements are recorded regardless of actual target emittance. While this methodology is fast and easy, it can lead to significantly understated Delta T repair priorities. The temperature displayed by a radiometer is largely dependent upon the emittance and reflected temperature values entered into the radiometers computer. Typically, errors in either of these settings will cause temperature measurement errors that are exponential in nature and can cause large errors in reporting Delta T’s. Example: Using an emittance value of 1.0 a thermographer measures the apparent Delta T between two, uninsulated electrical bus bars to be 44ºC. How much can observed temperature vary due to emittance values? As there is no way to correct for errors introduced by apparent Delta T measurements, thermographers should utilize correct emittance values whenever possible. As always, all thermal anomalies detected during an infrared inspection should be investigated and proper corrective measures undertaken as soon as possible. Infrared inspections of flat roofs are one of the many applications covered in the Infraspection Institute Level I Certified Infrared Thermographer® training course. For course schedules or to obtain a copy of the Standard for Infrared Inspection of Insulated Roofs, visit Infraspection Institute online or call us at 609-239-4788. “How often should electrical systems be thermographically inspected?” Historically, accepted industry practice has recommended that infrared inspections be performed annually; however, site specific conditions may dictate considerably shorter intervals for some equipment or facilities. Semi-annual infrared inspections may also be prudent where unscheduled outages of electrical equipment could pose significant environmental or safety hazards, or result in catastrophic damage to other systems or components. Because infrared inspections are only effective when electrical system components are energized, it is imperative to perform infrared inspections when subject equipment is operational. For facilities with seasonal equipment such as heating and cooling systems, it may be necessary to schedule infrared inspections on several different days spread throughout the calendar year. As always, infrared inspections of electrical systems should only be performed by properly trained and certified thermographers following all appropriate safety precautions. For information on thermographer training and certification or to obtain a copy of the Standard for Infrared Inspection of Electrical Systems and Rotating Equipment, contact Infraspection Institute at 609-239-4788 or visit us online at: www.infraspection.com. To obtain a copy of NFPA 70B, contact the National Fire Protection Association at 1-800-344-3555 or visit them online at: www.nfpa.org. The past few years have seen a marked increase in the use of thermography to help detect the presence of mold. When working near mold, thermographers should be aware of the health risks associated with it and take appropriate safety precautions. Molds are microscopic organisms found everywhere in the environment, indoors and outdoors. When present in large quantities, molds have the potential to cause adverse health effects. Such effects include: sneezing, cough and congestion, runny nose, aggravation of asthma, eye irritation and skin rash. People at greatest risk of adverse health effects are individuals with allergies, asthma, sinusitis, or other lung diseases and those with a weakened immune system. Mold growth is common on organic building materials that have been wet for sufficient periods of time. Wetting can be the result of structural leaks, high relative humidity, or flooding. When present, mold can appear as discolored areas, woolly mats or a slimy film. Mold is often accompanied by a foul, musty, or earthy smell. Lastly, mold can only be positively identified through proper laboratory analysis. Whenever mold presence is suspected, verification testing should be performed by a qualified mold professional. Detecting latent moisture within structures is one of the many topics covered in the Infraspection Institute Level I Certified Infrared Thermographer training course. For more information including course locations and dates, visit Infraspection Institute online at www.infraspection.com or call us at 609-239-4788. For more information on mold or to locate a qualified mold professional, visit the National Organization of Remediators and Mold Inspectors. Windows are semi-transparent materials placed between an object and an infrared instrument to separate conditioned from unconditioned spaces. When measuring temperatures through a window, it is imperative to know and enter the Transmittance value of the window into your radiometer’s computer to help ensure temperature measurement accuracy. Because no object is 100% transmissive, infrared windows will always have Transmittance values of less than 1.0. Following the procedure listed below, it is possible to calculate the T value of any window. Calibrated imaging radiometer with a computer that allows user to input Reflected Temperature and Emittance values. Blackbody simulator with E ≥ 0.95 heated close to temperature of target to be measured. Window that is semitransparent in the waveband of the imaging radiometer. Place imaging radiometer at desired distance from blackbody simulator. Aim and focus imager on blackbody simulator. Place crosshair on center of blackbody simulator. Measure and compensate for Reflected Temperature. Measure and note apparent temperature of blackbody simulator. Place window directly in front of imaging radiometer’s lens. Without moving imager, adjust E control until observed temperature matches value obtained in Step 5 above. The displayed E value is the Transmittance percentage for this window with the subject imaging radiometer. For greater accuracy, repeat above steps a minimum of three times and average results. The above procedure is described in detail in the Standard for Measuring and Compensating for Transmittance of an Attenuating Medium Using Infrared Imaging Radiometers available from Infraspection Institute. For more information or to place an order, call 609-239-4788 or visit us the Infraspection Online Store. It is always good practice to consciously check your imager’s clock each time you start your imager and make any necessary adjustments. Be certain to check your clock periodically during your inspection and whenever you restart your imager such as after a battery change or power interruption. 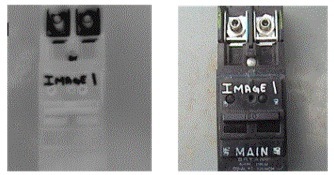 If your imager frequently displays incorrect time, it may be indicative of a defective or dead internal battery. To help avoid this problem, arrange for replacement of internal clock batteries whenever you have your imager serviced or repaired. Infrared imager operation and use are two of the many topics covered in the Infraspection Institute Level I Certified Infrared Thermographer® training course. For more information or to register for a course visit us online at www.infraspection.com or call us at 609-239-4788. Infrared inspections of building envelopes may be performed to detect evidence of thermal deficiencies and/or latent moisture. 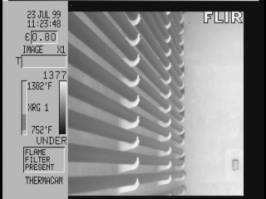 Typically, infrared inspections cover the exterior walls, windows, doors, and ceilings or roof of the structure. Depending upon the reason for the inspection, the inspection may be performed from either an interior or exterior vantage point. Regardless of vantage point, complete coverage all subject surfaces is critical to inspection success. One method of helping to ensure complete coverage is to begin the inspection at a recognizable reference point such as a main doorway or other easily identified feature. From this starting point, the inspection is conducted for all subject surfaces of the building while moving in a clockwise fashion. Moving in a clockwise fashion allows a thermographer to move in a logical and predetermined fashion around the building. This practice will work equally well when working from either the interior or exterior of the building. 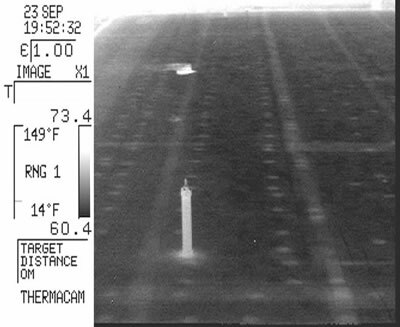 When thermal imagery is recorded to videotape, clockwise routes can help a viewer to better understand recorded data when viewing the tape at a later time. The topic of infrared inspections of building envelopes is covered in all Infraspection Institute Level I training courses. For more information on thermographer training or to obtain a copy of the Standard for Infrared Inspection of Building Envelopes,contact Infraspection Institute at 609-239-4788 or visit us online at www.infraspection.com. Infrared inspection of flat roofs and proper equipment selection are two of the many topics covered in the Infraspection Institute Level I Certified Infrared Thermographer® training course . For more information or to obtain a copy of the Standard for Infrared Inspection of Insulated Roofs, visit Infraspection Institute or call us at 609-239-4788. The topic of emissivity is covered in all Infraspection Institute Level II Certified Infrared Thermographer® training courses. For more information on thermographer training, including class locations and dates, call us at 609-239-4788 or visit us online at www.infraspection.com. Use Emittance Tables – Be certain to use tables that match your radiometers spectral response and your target’s temperature. Estimate Emittance -Choose representative sample and test for emittance value. Use these values whenever similar object is encountered in the future. Measure Emittance Value – Use subject radiometer to measure target E value. This practice is preferred as it provides the most accurate emittance values. The procedure for measuring emittance values is described in detail in the Standard for Measuring and Compensating for Emittance Using Infrared Imaging Radiometers available from Infraspection Institute. For more information on infrared standards or thermographer training, call 609-239-4788 or visit us online at www.infraspection.com. Understanding the impact of environmental conditions on infrared inspections is one of the many topics covered in the Infraspection Institute Level I Certified Infrared Thermographer® training course. For more information including course locations and dates, visit Infraspection Institute online or call us at 609-239-4788. Process furnaces or heaters are a critical component found in many petrochemical refineries. Performed properly, infrared inspections of furnace tubes can provide valuable data regarding tube condition and operating temperature. Process heaters are large, refractory-lined structures used to heat hydrocarbon product during refining. Process heaters are similar to steam boilers in their construction except that hydrocarbon is passed through the firebox tubes instead of water. Safe operation of process heaters requires that tubes operate below their maximum operating temperature. Overheating of tubes can reduce operational life or lead to catastrophic failure. Measuring tube temperatures is difficult for many reasons. Tubes are often remotely located from inspection ports and are frequently obscured by visually opaque flames. High temperature environments make contact measurements difficult or impossible. Under the right circumstances, infrared thermography can be used to provide qualitative and quantitative data for in-service heater tubes. The following images were taken through viewports on operating heaters. 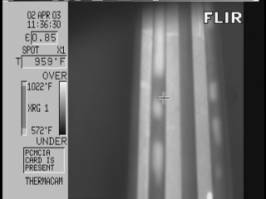 Thermal image shows normal thermal pattern. Image taken through opaque flame. Thermal image shows hotspots caused by internal coke deposits. Infrared inspection of process furnaces or heaters is one of the most difficult tasks for thermal imaging and infrared radiometry. Accuracy in temperature measurement is of paramount importance since many companies utilize infrared data to determine safe operating limits for in-service heaters. Far from being a “point and shoot” application, a thermographer needs to understand heater operation and heat transfer as well as issues pertinent to thermography. These include, but are not limited to: infrared camera selection including proper spectral response and spot measurement size; imager calibration; use of filters, windows and heat shields; calculating emittance and reflected temperature; equipment precision and accuracy; and how to obtain reliable reference temperatures to verify proper imager settings. To help ensure accuracy, thermographers should be trained to at least Level II and, when possible, work with an experienced mentor until they have gained sufficient field experience. Infrared inspection of process heater tubes is one of the applications covered in the Infraspection Institute Level II Certified Infrared Thermographer® training courses. For more information or course schedules, visit us online at www.infraspection.com or call us at 609-239-4788. More information on this subject is available a free download from this website by visiting: Applications of Infrared Thermography for Petrochemical Process Heaters. The ever-increasing awareness of thermography causes many to consider offering infrared inspection services through new or existing business ventures. In general, the time has never been better than the present for starting an infrared consulting business or adding infrared inspection services to an existing company’s services. The advent of lower cost technology has increased the number of commercial thermal imagers being offered while reducing the cost for same. This, combined with a greater awareness of the technology, has served to increase the demand for infrared inspection services. During the past two years, the lower cost for infrared imagers and software has been an inducement for many large companies to purchase equipment; it has also attracted a number of entrepreneurs to the industry as well. Despite the fact that infrared equipment has become cheaper and the number of infrared consultants has increased, there remains a shortage of experienced, competent thermographers. From all market indications, this shortage of quality thermographers should provide favorable business opportunities for the next several years. Lastly, once a decision has been made to offer infrared inspection services, thermographers should obtain quality training and certification before they purchase infrared inspection equipment. For more information on training or certification services, contact Infraspection Institute at 609-239-4788. For more information on thermographer training and certification or to obtain a copy of the Standard for Infrared Inspection of Electrical Systems and Rotating Equipment, call Infraspection Institute at 609-239-4788 or visit us online at wwww.infraspection.com. Infrared inspections of power distribution systems is one of the many topics covered in the Level I Infraspection Institute Certified Infrared Thermographer® training course. For information on thermographer training including course locations and dates, visit us online at www.infraspection.com or call us at 609-239-4788. As part of their infrared inspection reports, thermographers frequently include exception diagnoses along with recommendations for repair. In this Tip, we offer our suggestion for the only recommendation a thermographer will ever need. When used as a tool for Preventive/Predictive Maintenance, thermography can detect and document evidence of thermal patterns and temperatures across the surface of an object. The presence of inexplicable thermal anomalies is often indicative of incipient failures within inspected systems and structures. Because thermography alone cannot determine the cause of an exception, other diagnostic tools must be employed to determine the cause of observed exceptions. Although thermography is inconclusive, thermographers frequently provide opinions as to the cause of exceptions without having the benefit of confirming test information. Such opinions are frequently accompanied by elaborate recommendations for repair. When such observations/recommendations are incorrect, they can cause repair efforts to be misdirected. Unless a thermographer has performed, or has access to, confirming tests, providing opinions regarding the cause of exceptions and subsequent recommendations for repair is unwise. When confirming test data are unavailable, a prudent thermographer should make only one simple recommendation: “Investigate and perform appropriate repair”. Generating standards-compliant reports is one of the many topics covered in the Level I Infraspection Institute Certified Infrared Thermographer® training course. For information on thermographer training including course locations and dates, visit us online at www.infraspection.com or call us at 609-239-4788. For more information on tornadoes and tornado safety, visit the NOAA website. For years, many thermographers have sought to qualify the severity of detected exceptions by measuring temperature rise. Although this technique is widely practiced, failure to understand key issues can lead to misdiagnoses and unplanned downtime. For over 25 years, thermographers have frequently attempted to qualify the severity of detected exceptions by comparing the temperature of the exception to similar components under similar load or to ambient air temperature. Although qualifying exception severity may be desirable for maintenance planning, it also involves a certain degree of risk management as some exceptions may rapidly deteriorate and lead to an unplanned outage. At present, there is no scientific method for accurately predicting time to failure based upon operating temperatures of electrical or mechanical components. In order to reduce the likelihood of an unplanned failure, every exception detected should be investigated for cause and properly repaired as soon as possible. An Emittance Greater Than 1.0 ? According to the laws of physics, only a perfect blackbody may have Emittance of 1.0. Although the E value of real objects must be less than 1.0, some radiometers allow entry of E values exceeding 1.0. The following describes how these radiometers achieve the impossible. Emittance is a measure of how well an object radiates energy when compared to a blackbody at the same wavelength and temperature. Emittance for any object is measured on a scale between 0 and 1.0. Since blackbodies (E=1.0) exist only in theory, real world objects will have E values of less than 1.0. The E value of an object can never exceed 1.0. Assuming that most objects are opaque (T=0), they must be somewhat reflective. When making an infrared temperature measurement, this reflected energy represents an error source. To overcome errors due to reflections, quality radiometers have inputs for reflected temperature. By measuring reflected temperature and entering this value into the radiometer’s computer, this error source is compensated for in the radiometer’s software. Less sophisticated radiometers often lack inputs for reflected temperature. To compensate for this, these radiometers allow the user to exceed E values of 1.0. Although this overcompensation may allow the user to match a desired reference temperature, it can lead to significant errors. For infrared temperature measurement, the best solution is to use quality radiometric equipment and eliminate or avoid reflections whenever possible.